About a year ago we wrote about some unexplained sinkholes that just opened up, taking houses, cars and sometimes people deep into the earth without warning. There were various theories; some thought abandoned mines were the cause. Others wondered if something odd wasn’t occurring deep in the Earth. Since then the problem has not only been on the increase . . . some of the sinkholes are so large and so deep they are getting scary. One sinkhole 50 feet wide and about 600 feet long suddenly opened under the parking lot at a newly completed IHOP Restaurant in Meridian, Mississippi, swallowing 15 parked cars. Fortunately no one was hurt. Big sinkholes have been occurring under busy paved highways all over the world, sometimes taking vehicles and their drivers with them. 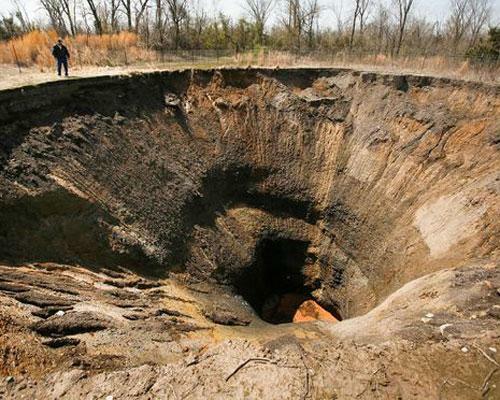 In Oklahoma, a big perfectly round sinkhole 40 feet wide and 40 feet deep appeared overnight in a farm field near Sayre. Another one has opened at Picher, the site of years of underground lead and zinc mining. In Israel an estimated 3,000 sinkholes have opened up around the Dead Sea. This phenomenon began in the 1980’s and is continuing, getting worse with each passing year. Geologists say the holes are now forming at a rate of about one a day. While this is going on, the Dead Sea is drying up. What is the connection? Is the water flowing underground into unseen sinkholes under the sea? A massive crack at least 750 yards long and 50 yards wide has begun to swallow part of the Big Horn Mountain range near Tensleep, Wyoming. Officials for the Wyoming Geological Survey say they have mapped over 40,000 sinkholes in that state alone in recent years. There has been extensive fracking occurring in that state and some theorize there may be a connection. And in California, geologists say the entire state is sinking at the rate of about one foot per year. They are blaming the extreme drawing of water from underground aquifers to maintain the large crop and dairy farming operations, and maintain drinking water demands in heavily populated areas for this phenomenon. The town of El Nido, in California’s San Joaquin Valley, was recently found to be sinking by a record two feet per year. The sinking is destroying bridges, cracking irrigation canals, twisting highways and destroying buildings in California. An elementary school in Fresno County, known for its almond farms, is slowly falling into a miles-long sinkhole. If the entire state is dropping, does this mean California is turning into one big giant sinkhole?